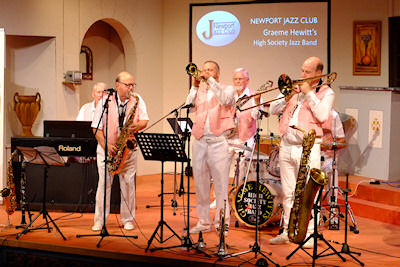 On Sunday in a packed Apollo Theatre the members of Newport Jazz Club were transported to New Orleans for two hours of excellent trad jazz performed by the Graeme Hewitt High society Jazz Band. Opening with "Hello Dolly" made famous by, probably, New Orleans� most famous son Louis Armstrong the audience were then treated to an superb rendition of another down south favourite "Basin Street blues". The 19 number set included their homage to band friend Chris Barber with a version of his number "Harlem bound" but it was not all fast and rousing numbers as there were changes of pace including a beautifully sublime version of "Misty" led by Lester Brown on flugel horn. 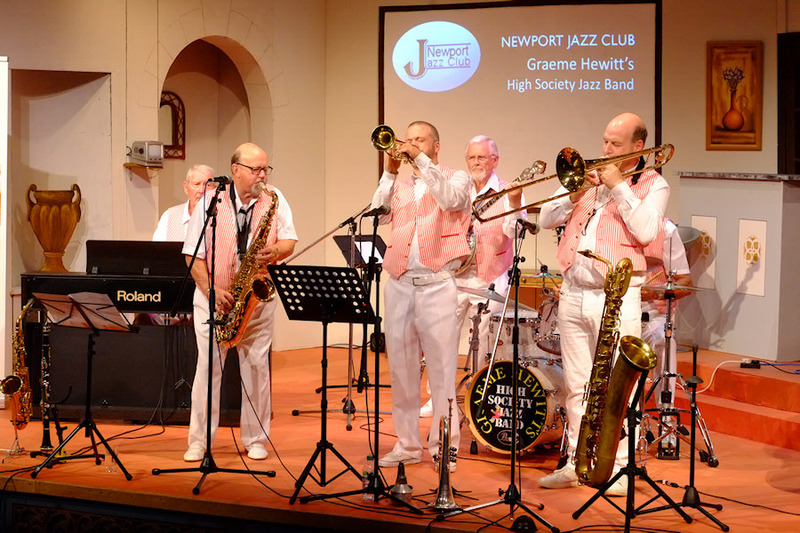 The full band comprised Graeme Hewitt on sax and clarinet, Lester Brown on trumpet and flugel horn, Mark Aston on trombone and baritone sax, Perry Lock on piano, Dave Moorwood on banjo & guitar, Steve Watling on drums and Leon Simmons on double bass. During the second set the band was augmented by island born Tim Eyles on bugle for a rousing rendition of "Bugle boy march". An excellent afternoons entertainment all rounded off with that old New Orleans favourite "When the Saints go marching in." The next concert will be on Sunday 19th November club has plays host to sax man Greg Abate together with the Craig Milverton Trio. Tickets are available from Bill Wills on 523879.